Located in Marietta, Georgia, Six Flags proudly presents to you one of it's flagship Six Flags attractions! Six Flags White Water, as its name suggests, is one of the best waterparks in the South! Choose one of 8 exceptionally thrilling and heart pounding rides before you move on to any family or gentler rides. The 100-Meter Splash will have you competing with up to 5 other guests as you slide down on a flat mat, head first gaining high speeds and exciting thrills! Or head to the Cliffhanger where you will find yourself body sliding down an insanely high 9 story slide, creating the greatest free fall ride of your life! Looking for more of a twist? Try the Tornado created via a 60 foot wide funnel which you will travel down with 3 other folks in your party! Twisting and turning all the way through the funnel and a 132 foot tunnel, this ride does not disappoint. 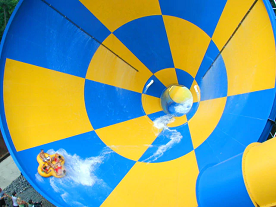 If you're headed to Six Flags White Water with family rides in mind, have no fear as Six Flags offers guests 8 exceptional family rides such as the Bahama Bob Slide where jumbo sized rafts will transport you all with high speeds down a six story river! Or the Lizard's Tail which provides for a gentler body slide on your back through plumes down to a cooling pool of water. Popular too is the Run-A-Way River where 3-4 of you can jump in to a raft to take an exciting ride down a maze of tunnels and waterfalls designed to give you just enough of a thrill to keep coming back! Children can enjoy 5 specialty attractions designed specifically for their likes such as the Lilypad Crossing where guests can balance their way over a series of lily pads placed in the pool, or the Little Hooch River - a lazy river for the little ones. A favorite is Tree House Island where the little ones can enjoy a play structure full of splashes, climbable platforms and surprising fountains! Best of all? As a 5000 gallon bucket fills with water , it will eventually tip over dumping its refreshing waters on those below! The anticipation of this fun event is what keeps kids and adults alike smiling! Includes both Six Flags Over Georgia and White Water Unlimited admission to Six Flags Over Georgia and White Water Includes park admission to Fright Fest Includes park admission to Holiday in the Park Unlimited admission to ALL Six Flags theme parks Tons of additional SUPERMAN edition benefits. Enjoy Six Flags Over Georgia and White Water all year with our premiere selection of park benefits! All of the regular Season Pass or Membership benefits Season or Membership Parking for each Gold Pass Holder Extra free friend ticket for Gold Pass Holders on a select day Season or Membership Parking at every Six Flags theme park Includes park admission to Fright Fest Includes park admission to Holiday in the Park Tons of additional SUPERMAN edition benefits. To view Six Flags White Water Tickets, Specials and Coupons, go to their special page by clicking here. Six Flags White Water updates this page throughout the year, so check back to see if new specials and coupons have come in. Note to our visitors: Six Flags White Water Specials and Coupons can change without notice. So please visit their official website to make sure of the latest pricing and coupons.